Plastic window insulation can cut a major source of home heat loss in a matter of minutes. These kits are inexpensive – as little as a dollar per window if you buy the larger kits – and you can cover a window in a quarter hour once you get good at it. The plastic window covering seals off the indoors from outdoor drafts, adds a layer of still air between the window glazing and your living area, which improves insulation, and will give you a full heating season of comfort. And if properly installed, these window kits are virtually unnoticeable. The main benefits of plastic window insulation are reduced heating bills, reduced drafts, increased comfort, and better visibility due to the smooth, transparent plastic. These kits are great for renters, or for people on a tight budget. If you live in an apartment or a rental house, you can’t exactly pay to have old, drafty windows replaced with brand new energy efficient windows. But for a few dollars a window and a few minutes of work, you can get almost as much energy savings out of plastic window insulation. In a moderately cold climate, a 2×3 foot window can save you about $6-8 in heating costs, if you heat with natural gas. If you use an electric heater you’ll save perhaps double that per window. For a half dozen larger windows you could be looking at $100 or more in savings per winter. Plastic window insulation can reduce drafts from leaky windows, although you’ll get better overall results (in terms of comfort and energy savings) if you first reduce the drafts from your windows (see under Preparation below). I remember the 100-year-old wooden house we rented in Ohio for three years: we had 7-foot-high windows with no storms and no weatherproofing; these window kits made a huge difference in the winter. When the wind gusted outside, instead of feeling cold blasts of air in our living room, we got to sit in warm comfort and watch the window insulation bulge a little bit before settling back into shape! Finally, with the shrinking plastic window insulation I’m talking about here, you can see very clearly out your windows – in many cases you can barely tell the plastic is installed, except that you might see interior lights reflected in both the shiny plastic and the window glass. These kits are much better than buying regular plastic sheeting and trying to stretch it tight by hand, because the heat-shrinking property of the insulation (activated with a blow dryer) makes them completely smooth and wrinkle-free. Plastic window insulation can be cleaned by dusting with a dry cloth or feather duster, and if you’re careful when you take them down you can save the plastic (but not the tape) for the next winter too! Before we go into specific products it’s important to distinguish between plastic window insulation and energy efficient window film, which is a semi-rigid reflective plastic film you press against window glass to reduce radiant heat transfer. While plastic window insulation provides a layer of still air between your room and the window pane, insulating window film attaches directly to the glass and acts as a reflective shield, preventing infrared radiation (heat) from passing through the glass. This keeps your house warmer in winter and cooler in summer, but it does so by reducing direct heat radiation, not by creating an insulation barrier. (Window film is more like putting sunglasses on a window, while plastic window insulation is more like a winter jacket.) The term “insulating window film” can in theory refer to either plastic window insulation or reflective plastic window film. On this page I’m only referring to the window insulation kits. I got so caught up in putting plastic window insulation on my Ohio rental home that I bought a couple of 4′ wide rolls 50 feet long, and separate rolls of tape. (After all I had about 8 windows that were 3 x 7 feet each, so I needed a lot of plastic!) I haven’t seen the plastic rolls lately; mostly you buy kits in which there is either one large sheet of plastic or several smaller sheets. Plastic window insulation is kind of like Saran Wrap. It doesn’t stretch like Saran Wrap but you can get the same smooth, wrinkle-free look you get with Saran Wrap once you apply heat to the product. You can buy these window insulation kits it at most hardware stores, building supply centers, or online. In terms of plastic window insulation brands, I recommend you stick with 3M products. In my experience their product is top quality. There are other brands that are cheaper, but they don’t tend to work as well: the plastic rips too easily, or the tape doesn’t stick to the plastic. Avoid Duck brand products when buying a plastic window insulation kit. Apparently the plastic doesn’t stick to the tape – many reviewers have complained of this problem, although this doesn’t always mean the tape or plastic is at fault – sometimes faulty or hasty installation is the cause! Frost King window kits get mixed reviews; by and large people like this Thermwell window insulation but some have complained of the plastic not sticking to the tape (again, hasty installation could be the problem). You don’t have to use the heat-shrink plastic – regular clear plastic will also work but won’t look as good. For windows in rooms you’re not using much (or don’t care about the aesthetics), even opaque plastic is okay. I was able to find completely clear plastic at my hardware store that I stapled to the outside window frame, then taped around; if you staple it the same way you’d stretch a canvas over a picture frame, starting from the center of each edge and working your way to the corners, you can get an almost wrinkle-free look. There’s nothing worse than spending 15 or 30 minutes installing your plastic window insulation, only to watch it peel off or sag within hours or days of installing it, or find that it doesn’t actually do much to keep the cold out. So make sure you prepare things properly first. If the window itself is very leaky, with gaps between the window and frame (or the movable sash window and the fixed sash window), do what you can to seal those air gaps, before applying the plastic window insulation. For example, you can buy removable caulking to apply around the movable part of the window to seal it against drafts; the caulking can be peeled off in the spring after you remove the plastic window insulation. If your window glazing is held in place by putty and the old putty is cracked or missing in places, put on some new putty – it will make a big difference in keeping out the cold air. If the trim around your windows is latex semi gloss or high gloss paint, or old varnish, be forewarned that the double-sided tape used to hold the plastic to the window frame may peel some of the paint or varnish off when you remove it. Make sure you clean your windows before you cover them up in plastic for 3-6 months. It’s not much fun doing a perfect job on the plastic window insulation only to discover that what you see through it is dirt and grime on your glass panes. The same applies to the window frame itself: make sure it’s very clean and dry, otherwise the double-sided tape won’t stick. Finally, make sure you remove all window coverings (drapes, shades, blinds) before you put the plastic on. You can replace them after completing the installation. Cut away the excess plastic and blow-dry the plastic to shrink it to a perfect smoothness. Here are a few general pointers to keep in mind. Deep window sill: If the bottom of the window is a sill that protrudes a lot, you can put the tape on the top surface of the sill (facing up instead of into the room), but this means you should nail a 1/2 x 1/2″ piece of wood over top of the tape once the tape and plastic are in place – otherwise when you shrink the plastic with the blow dryer it will pull it off. Cutting the plastic: Remember the old adage: measure twice, cut once. I recommend measuring all windows before you start, and working out on paper how the amount of plastic at your disposal can be used most efficiently. When cutting, if you need to put the plastic on a flat surface to measure and cut, make sure you lay it out on a clean surface. Remove dust, dirt, animal hair/fur etc. from the surface first. You can’t clean the outside edge of the plastic once it’s up on the window! Applying the tape: Double-check that the window frame is dry. The tape is transparent so you can apply it directly to the front of the window frame. By window frame I’m referring to the trim (usually wood) that is installed over top of the wall. You don’t want to apply the tape directly to the wood or plastic frame of the window itself, because this won’t seal off the drafts that come through gaps between the moving and fixed parts of the window. Don’t leave gaps between the horizontal and vertical lengths of tape. And make sure you leave the white backing on the tape until the plastic is ready to go on. Hanging the plastic: Remove the tape backing from the top of the window frame; apply one corner of the plastic, and stretch the other corner of the plastic holding it slightly away from the tape, then slide your hand along from the applied corner to the second corner until the plastic is completely held against the tape. Then remove the bottom tape backing, pull down on the plastic, and apply from the center part of the plastic sliding out towards one corner, then again from the center to the other corner. The idea is to get as many of the wrinkles out up front as possible; this will mean less blow-drying later. Remove the backing on the left hand length of tape, and pull the left edge of the plastic slightly to the left and apply; continue pulling taut as you slide up or down and press in place. Repeat this for the right hand side. 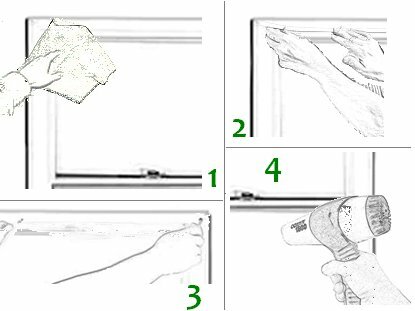 Blow-drying to shrink the plastic: Don’t start blow-drying your plastic window insulation until the adhesive tape has been on the window frame for at least 15 minutes. Otherwise the bond may not develop properly with the window frame and the blow drying will pull parts of the tape loose. Ideally you should not even apply the plastic until the tape has been on the window frame for 15 minutes but I’ve never been patient enough to wait that long! Hold the blow dryer a few inches from the plastic. If you hold it very close (because holding it further back doesn’t seem to warm it enough to cause the shrinkage you’re after), keep moving the blow dryer around. If you aim it at one area for too long and hold it right up to the plastic you risk (A) shrinking one area too much, which will make it hard to get a perfectly smooth look, and (B) burning a hole right through the plastic. I’ve done this a few times and unfortunately when that happens you don’t have much choice but to rip off both the plastic and the tape, and start over. Trimming: Use a razor blade or utility knife to trim off the excess plastic outside the tape edges: hold the blade flat and just away from the picture frame, and pull the plastic out; slice through the excess plastic and pull away. Over time some of your plastic window insulation may sag or wrinkle. This is usually easy to fix by getting the blow dryer out again and blow-drying until the wrinkles or sags go away. You can also remove dust and animal fur with a feather duster or a cloth. We had a shedding dog when we had plastic window insulation on our seven-foot-high windows; I found the dog hair stuck to the bottom part of the windows but could easily be wiped off. Be forewarned that cats or dogs who were used to jumping up onto or against the window or sill are liable to rip the plastic with their claws, or at least be in for a surprise when their head hits the plastic! If you are careful about removing the plastic – if you carefully peel it off and fold it up at the end of the heating season – you can often reuse the plastic the next year. I usually found that each year when I removed the plastic I lost a little – due to tears, or the fact that I trimmed the plastic down to size after installing – so the plastic from the big windows for one year became the plastic for the medium-sized windows the next year, and the plastic from the medium sized windows progressed to the smaller windows. Of course you can also start by putting the tape on the outside edge of the window frame the first year, and then each subsequent year moving the tape a little further in, according to how much plastic you have left. You can reuse the plastic 2-4 times before it starts to get too brittle to use again. Also, the more shrinkage from blow-drying each year, the less shrinking capacity it has left, which is why you want to stretch it tight before you start blow-drying it. Plastic window insulation rips easily when removed so go about removal slowly if you’re planning to use it again the next heating season. I’m wondering if there would be any harm in leaving the 3 M plastic on some of our windows year round? We don’t use this room during the warm months and it would be convenient to just leave it on the windows. There should be no problem leaving the 3M plastic window insulation on year-round. My experience is that, over time, the insulation will sag a little bit, but this doesn’t affect its insulation value, only aesthetics; if you use the room during the cold months you can often just blow dry it again in the fall to tighten the plastic back up. You may still have to replace the plastic in individual windows after a year or two, as the plastic does degrade from sunlight and age, but there’s no need to replace it if it is working perfectly well. We’ve used the film on the main door windows and left it on for several years. It helps keep condensation away from the curtains. I’m wanting to re- use the tape for kids projects ect. after each season. Does anyone have suggestions on how to rewrap the Double sticky tape for storage until needed?? I have lots of windows which equals LOTS of good tape that gets thrown away each year. Next year I should save the covering that comes off the tape, but that doesn’t help me this year. When I used plastic window insulation I tore off the tape (trying as much as possible not to rip the covering), and reused only the covering. I was able to buy replacement tape at my local hardware store, you can buy it off Amazon at double-sided indoor replacement tape – $4 for 24 feet, which seems very cheap and will probably cost less in the long run than trying to reuse old tape and risking that the windows do not seal properly. We’ve never had luck with the double side tape staying on out walls/windows. Can we use removeable caulk to secure the plastic? I don’t know if the reusable caulk would work. It is not a particularly strong adhesive in my (limited) experience, and when you blow-dry the plastic it will pull and perhaps just smear the caulk onto more of the plastic as it shrinks. You really need something like tape to keep the plastic still. One option is to scrub down the window frame with TSP or something else that removes oil and dirt. If your tape is not sticking it is probably either dirty paint on the windowframe, or the paint is old and comes off with the tape. If the paint is coming off, maybe scrape down and repaint the window frame. 3M tape has always stuck well for us. Are you using an off brand? Will the 2 sided tape stick to metal window frames? The window is in the shower and will get the plastic wet. Will it still work? The adhesive on the tape is not water soluble. That means it won’t come off because of water. On the other hand, it also won’t go on if the surface you’re applying it to is wet. Since metal window frames conduct heat more quickly than wood or vinyl window frames, the main risk is that you apply the tape when the window frame is cold, and condensation on the window frame from that cold could cause the tape not to adhere. You might want to blow-dry the frame right before applying the tape. Once it’s applied, the plastic should stick to it and not come off. The heat from the shower may cause problems with the plastic. It is worth a try since it will keep the room warmer, but I can’t guarantee that repeated exposure of the plastic window insulation to steam and hot water from the shower won’t damage the plastic. Can the plastic be recycled, like grocery store plastic bags are? Thanks. I have a big rectangualar window with three sections, almost floor to ceiling in my living room. There are two windows which open, one on each side of the larger center one which doesn’t open. Do I need to put up plastic over the whole expanse or just the two windows which open? It depends what you are trying to achieve. The plastic window insulation helps reduce heating costs in two ways: by cutting down on drafts, and by adding an extra insulating layer of air between the glass and your interior space. Putting the film only on the windows that open will cut down on drafts; if the window is properly built and relatively new, the big center one shouldn’t have any drafts. However, putting film on the big one will cut down on heat loss by conduction through the glass. I would recommend doing the whole window. If a sheet isn’t big enough to do the whole window at once you can buy the insulation in large sheet format (each of two pieces is 5×17 feet) and the double-sided tape separately. Is there an easy way to start peeling the backing off the tape? Is it really necessary to apply the blow dryer to shrink it? I don’t care about what it looks like, I just want it to keep out the cold. Thanks. It’s not necessary to apply the blow dryer. You’ll get exactly the same insulating / sealing effect whether you blow dry it to shrink it, or not. The only reason for blow drying is to make the surface smooth so it is less visible. After doing this for over 10 years the last couple of times I get a good tight fit then days later the tape is on the woodwork but the plastic begins to come off. Any ideas? If you’re using new plastic, then the tape is deficient. If you’re using old plastic (I used to reuse mine for several years), the plastic may have dust, dirt, or grease on it preventing proper adhesion. I noticed the plastic has a double layer. When I started blow drying, the second layer comes off. Should I be using the double layer or is single layer sufficient? Are you sure you bought the blow-dry type of window insulation? If so I suspect the problem is your plastic came folded, and you didn’t fully unfold it. If instead you have plastic insulation film, which goes directly on the glass and is designed as a light barrier (visible spectrum or UV, to reduce heat gain from sunlight rather than heat loss from drafts), then that sometimes comes with a thin layer of plastic that peels off as you apply the film to the glass – similar to how a cell phone screen protector is applied to the cell phone. I want to use this in the very large doorway between the kitchen and the solarium. I will have to use more than one sheet to cover this space. Will the sheets “meld” together when heated with the blow dryer or should I use the double sided tape to form a seal between them? You can get larger sheets, e.g. a 7-foot roll 25 feet long or this 7 x 10 foot sheet which will give a better look than taping two sheets together. In theory using the double-sided tape will work but a single sheet would be better. The sheets will not meld when heated. Can you tell me what’s the difference between heat gun and hair dryer. Can we use both in the same purpose? A blow dryer works well for this but if you are doing a lot of windows you should let the blow dryer rest a bit between successive windows so you don’t burn it out. A heat gun works well also but be careful to hold it far back from the plastic and move it slowly closer until you find the right distance to shrink the plastic without burning it. If you hold either a heat gun or blow dryer too close or for too long you’ll just burn a hole through it. I suspect the heat gun will burn a hole through at a closer distance than a blow dryer, though I’ve never used a heat gun on this stuff. Also, how do you deal with mini blinds? I’m thinking of just leaving mine up all winter and installing curtains. If the wall is plaster it’s usually safe to tape to that, but I wouldn’t tape it to drywall, as the tape will pull the paper coating on the drywall off when you try to remove it. The problem with putting the tape on the window frame at right angles to the window area is that when you blow dry it, the tension of the shrinking plastic window insulation starts to pull at the tape and may either lift the tape off the frame, or lift the plastic off the tape. So your options are, on the plaster, or risk damaging the drywall, or put it on the frame but don’t blow dry the plastic quite as tight as you might like for appearance sake so there’s less tension on the tape. The other thing you could try is ot cut very thin strips of wood (1/2″ square cross section) and nail them, on top of the taped plastic, into the wooden window frame edge with a few finishing nails. That way when you blow dry it, the wood strips hold the plastic in place. A few small nail holes in the window frame are probably less damaging than ripping drywall. I applied plastic window film and my energy bill took a nosedive. Well worth the effort. Forget the big bill installing new windows. Do you have any experience with window inserts? I am considering these for my very large drafty windows. I don’t have experience with these but they seem like a good alternative to plastic window insulation. They look easier to install and remove each year. The only downside is that if you want to open the windows in warm weather you’ll need a place to store them in the warm season. I rent an apartment but I want to reduce our energy bill by insulating the windows. Will the tape damage the window frames or leave a residue? Thanks! The tape does not leave a residue. If the window frames are painted wood and the paint appears thin or brittle, then taking the tape off at the end of the winter may cause the paint to peel in places. But you’d probably still save money if you put the plastic window insulation on, and bought a small can of paint in the spring to touch up any places where it peeled, than to do nothing. What do you think of applying both the window film and window insulation to windows? They are for different purposes, I would say the window film gives you the best energy savings. You’d be better investing the extra money in doing more windows, or in draftproofing doors, but if funds are unlimited you could do both.